What you need to do to protect your home from burglars? Today you will get tips on how to protect your house from theft. Alan Young is the CEO of ArmorConcepts and he learned the hard way about getting ripped off. He was renovating properties and people kept kicking in the doors on these properties and taking everything that he has: pipes, cabinets, anything he left behind. There is a misconception that burglars are real sophisticated guys who have some fancy ways about picking locks. They do not do that. Thieves are less smart than they are. 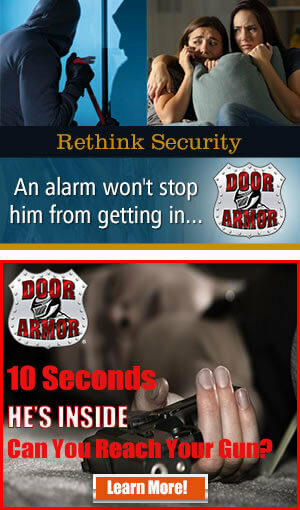 Most burglaries happen through a door, about 85% and the easiest way to get in is to kick in the door. Just like you see on the television. How cops get into a place? They kick in the door. So the bad guys. This is because it’s the easiest way, it takes about 10 seconds. They take a step back, they kick the door in, they are in and out in 5 minutes. They don’t even break windows. That’s another misconception. Windows make a lot more noise than doors do. What about burglar alarms? They work. Don’t they? People need to understand the difference between detection and prevention. A burglar alarm does nothing to stop someone from coming into your house. Burglar alarm tells you that someone is already inside of your house. The thief is going to be in and out in about 5 minutes. Typical police response time is a little more than 20 minutes. So thieves are in and out long before the police get there. It used to be that thieves were in to steal something like television or some large items. They do not do that anymore. They are looking for jewelry and small things they can throw in a bag and just walk away. So they are going to kick in your door, they go to your bedroom, find a jewelry, money, laptop, anything else and they are to going to take mental inventory of the things that you have and then they’re going to come back to get anything that they didn’t have time to get the first time. Let’s go to the tips. It amazes me that people actually post vacation plans on Facebook. That is the first thing that they should learn. Do not post your vacation plans on Facebook. That is the easiest way to become a victim. You have no idea who’s looking at your pages. People on Facebook say they are your friends, but they are not always your friend. That’s how you become a target. A lot of people know this, but it’s worth repeating – a well-lit home is a good deterrent. Most burglars really don’t want to enter your house if they know you’re there. So one of the better ways to make sure that your house does not become a target is to keep it lit. Make sure it appears that you are home, even if you’re not. Another tip is to buy Grade 1 deadbolt. It’s much better deadbolt. It has a thicker throw, it does not break easily, and it has better picking protection. As far as feet breaking trough, a great deadbolt is going to stand up better with the product I’m going to talk about. Otherwise it’s just going to be in a soft piece of wood. Wooden door frames are not very secure. But this product can change that. 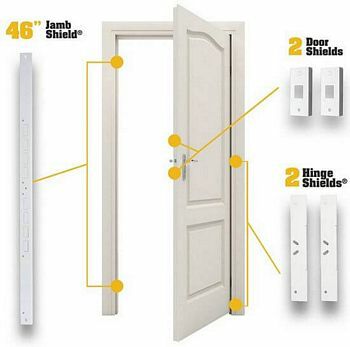 Door Armor is a simple product. This is what a door generally looks like after it’s been kicked in. This needs a really expensive repair. Or does it? 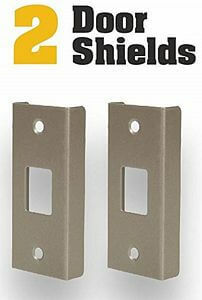 Jamb Shield is made of steel and it reinforces the door frame. If used beforehand, the doors are not going to be kicked in. It’s gonna protect it. If you use it after, you can use it as a repair and you don’t have to go out and buy a new door. So if you want bad guys not penetrating your door, you must have metal. The other piece that is very important is Door Shield. If you just protect the lock part of the frame, and you don’t protect the actual door itself where the locks go, the deadbolt is going to split the door in half. That’ why you need to install the Door Shield. 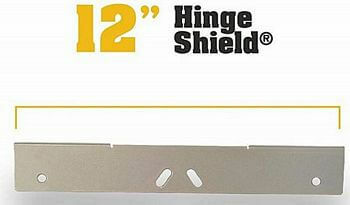 The last piece is Hinge Shield. It actually reinforces the hinges. You do not want a weak link on your door. You must protect all the weak points on your door. And that’s what Door Armor Max Combo Set is doing.